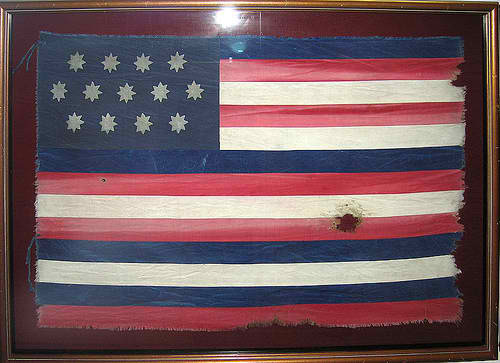 The “Serapis” or “John Paul Jones” (also known as the Franklin flag) refers to an unconventional, early United States ensign flown by Jones from a captured British frigate. When U.S. Navy Captain John Paul Jones captured the British frigate Serapis, his own ship, the Bonhomme Richard, was sunk. The ensign had been blown from the mast into the sea during the battle. Jones, now commanding the Serapis without an ensign, sailed to the island port of Texel, which was run by the neutral United Provinces. Based upon this description, a recognizable ensign was quickly made to fly aboard the Serapis. Dutch records were edited to include a sketch of the ensign to make it official. The Dutch recognized the flag and avoided the legal controversy of Jones’ captured ship. The Dutch records survive and provide us with the original sketch of the ensign dated 5 October 1779. The Serapis flag is distinctive because of the four, irregularly placed blue stripes and 8-pointed stars.